What do US Senator William Blakley, Tom Braniff, the Butterfield Stage Line, University of Texas and Scottish Rite Hospital all have in common? Answer: The Concho Stage Station. In the mid 1800s, the desire for travel to the West Coast was inspired by the development of California and the Gold Rush. Gold was discovered in 1848, California became a state in 1850 and people began to migrate west to the coast, requiring the development of such services as the US Mail. A number of stage coach lines served the mail for portions of the route before the Butterfield line came into existence and unified a southern route until the onset of the Civil War. 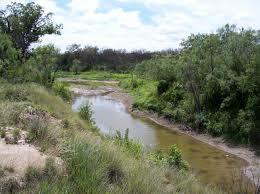 The Middle Concho River ran roughly east and west for about 90 miles between Upshur and Irion Counties and was a valuable and reliable water source. Once coaches left the Concho, it was another 75 miles west to the Pecos. The station at the head of the Concho was one of a couple dozen that were built in Texas to serve the line. Troops and supplies along with replacement horses and mules were all part of this well equipped station. After Butterfield’s southern route was cancelled by the Union government in 1861, stage service continued for another two decades until rail lines finally reached El Paso. The Concho Stage Station eventually fell into ruin as nearby settlements like San Angelo took hold. The Concho Stage Station is not to be confused with historic Fort Concho, established in 1867, which gave rise to the settlement of San Angelo. The Stage Station is located roughly 20 miles to the west of Fort Concho and present day San Angelo, and is situated a few miles to the west of the community of Arden, Texas. The old Concho Station eventually became part of the Rocker b Ranch, owned by US Senator William Blakley, who was the attorney for Tom Braniff, founder of the Braniff Airline company. Braniff and Blakley, who was also a large stakeholder in the airline, founded the Blakley-Braniff Foundation. Blakley and his wife had no children of their own and in 1964, the foundation donated the 173,000 acre Rocker b Ranch to Scottish Rite Hospital. A decade later, the property was appraised at $60,000,000 and was generating some $4,000,000 in annual oil royalties from its 570 wells. Before Blakley died in 1976, he would reportedly express his misgivings about the charity holding onto the ranch, opining that it should have been sold to help serve more crippled children currently. However, the charity continued to hold onto the property and as recently as 2014, annual oil royalties had risen to $148,500,000, eclipsing the value of the entire ranch decades earlier. The University of Texas began an archaeological research project in 1993 after negotiations between the charity and the university. The entire ranch was surveyed and the stations ruins were uncovered to reveal the large limestone stage headquarters, an enclosure large enough to house a wagon, team, corral, a water storage area, fireplaces or blacksmith forge, storage room and one other room. Outside the structure were found concentrations of glass and other ceramic fragments, rusted tin cans and other metal pieces, the stone ruins of an outbuilding, possibly the guard house. Lead musket balls, bullets and cartridges from revolvers, carbines and rifles were also located, as was the main path of the Overland Road, which crossed east to west just north of the ruins. The archaeological project provides much insight into the station and the life and times of this period. This memorable era eventually came to a close, but with the discovery and development of the stage station at the Head of the Concho and others like it, much has been learned about its role in the development of the West. To learn more, please see Larry Reimenschneider’s excellent report on the archaeological research on the Concho Stage Station from the Bulletin of the Texas Archaeological Society.